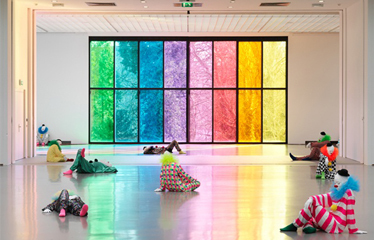 Museum Boijmans Van Beuningen presents Ugo Rondinone – Vocabulary of Solitude: the first, comprehensive mid-career solo exhibition of the works of Swiss artist Ugo Rondinone (1964). Rondinone had his breakthrough in the nineties with his spatial installations, in which he combined various disciplines such as light, sound and architecture. Clowns and rainbows are recurring themes in his work and also prevail in this exhibition. Ugo Rondinone – Vocabulary of Solitude consists of 45 sculptures of lifelike clowns, captured in everyday actions, which have not been exhibited before. Ammodo supports the exhibition to contribute to the exposure of Rondinone’s work in it’s entirety.